Coaching to Connect has developed a "state of the art" sponsor couple training program to help engaged couples prepare for a happy and successful marriage. CLICK HERE to learn more about this innovative new approach to sponsor couple ministry! From Day 7: "If you are grateful for what you have, then you will always have enough. Gratitude will change your vision. You will see people, places, things and events with new and more hope-filled eyes. Be open to the surprising truth that your life is more beautiful than you think it is." The Gratitude Journal is a simple tool to help you transform your relationships in a remarkable way. Change your spiritual consciousness from disappointment, judgment and bitterness to appreciation, joy and peace by spending a minute or two each day reflecting upon and writing down your gratitude list. Thousands upon thousands of people have experienced renewed happiness in life from the scientifically-proven spiritual practice of gratitude journaling. The Gratitude Journal includes an introduction with instructions on how to do gratitude journaling. The introduction is followed by 40 days of journaling with gratitude reflections for each day. 52 pages - soft cover - 5"x7"
This book, co-authored with John Roberto and Dr. Kathie Amidei, surveys the latest developments in the theory and practice of intergenerational ministries. Every congregation can discover its intergenerational heart and soul, and become an intentionally intergenerational community that nurtures the faith of all ages and equips them for gospel living in daily life. Generations Together helps ministry leaders capture the vision of the intergenerational church, the full body of Christ, and is filled with case studies and practical resources for implementing the vision. Being a godparent is a lifelong responsibility. Godparents have a privileged opportunity to assist parents in passing on spiritual and religious values to their children. It is true that it takes a village to raise a child, and godparents are key child-rearing villagers. This simple booklet will help you become aware of the critical importance of the godparenting role and offers many practical suggestions for honoring the role effectively in the digital age. The Way of the Cross is an ancient ritual that helps people to reflect upon the mysteries of suffering and committed love. This spiritual resource is designed to be used by families at home. 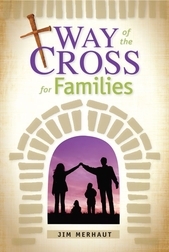 Way of the Cross for Families will help those who use it unlock the work of God that is often hidden in the rigors of daily life. Illustrated with full-color artwork and photography, this beautiful booklet is sure to become a family tradition that will reinforce spiritual values in the home year after year. 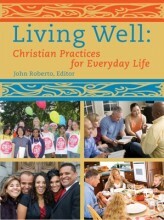 31 pages - soft cover - 5 1/2" x 8 1/4"
This practical and colorful tool, co-authored with John Roberto and others, introduces twelve common practices that fill the lives of Christian households. We all hunger for a meaningful life. We want a faith that makes a difference in our homes, workplaces, communities, and world. We look for ways to deepen our relationship with God each day, and we hope that our children and grandchildren will find purpose for their lives in a loving relationship with God supported by a strong faith community. Living Well is a "how to" book. You'll learn about each practice through real-life stories and how the practices are rooted in the Bible. You'll find multiple practical suggestions for incorporating each practice into your daily routine. Each chapter is a mini-retreat in itself. Coaching fees are established in accordance with industry standards. Working with a coach requires both a personal commitment of time, energy and finances. Open and honest communication is essential for a successful coaching relationship, therefore any financial concerns or questions should be voiced in initial conversations before the agreement is made. Coaching to Connect payments can be made by check, credit card, or secure online bank transfer. Coaching to Connect is PCI compliant. All payments are directed through a secure credit card processing institution (Intuit Payment Network). No credit card or bank information reaches the computers or offices of Coaching to Connect or is stored on this website. We complete the Control Scan Self Assessment Questionnaire annually to maintain industry best practices for your security. We are certified as PCI-DSS (Payment Card Industry - Data Security Standard) compliant!